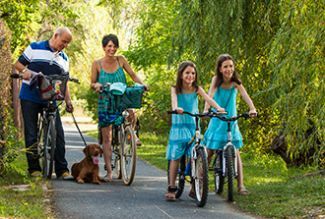 The Bakony & Balaton Bike Rental Network provides every visitor the possibility to spend their free time active and discover the attractions and the landscape’s beauties in the Bakony and Balaton Region. You can find rental network points everywhere in the region (Balatonkenese, Balatonalmádi, Várpalota, Veszprém, Zirc, Pénzesgyőr, Nemesvámos, Dörgicse, Tapolca, Kapolcs, Sümeg, Megyer, Somló, Halimba, Aszófő), so you can freely plane biking tours. You can give back the bike at any rental points, independently where you rented it. The bikes are suitable for urban and light off-road cycling. Equipment: front and rear derailleurs, fenders, brakes, rack, lamp, reflector both on front and rear wheels. Safety vest, safety helmet and bike lock is provided free of charge.